At the KABK we champion the latest techniques while embracing traditional craftsmanship. In this workshop, we use a combination of contemporary digital techniques as well as analogue techniques developed 150 years ago. We focus on a mix between work created by hand and digitally. 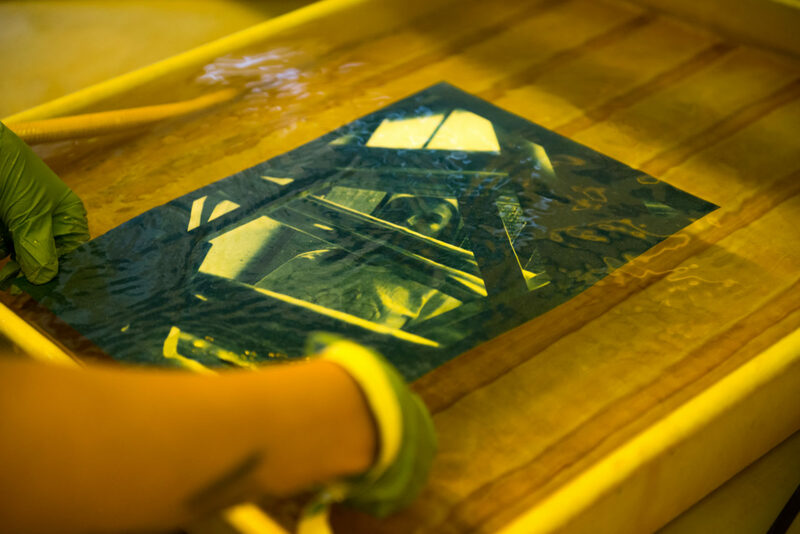 We create our own emulsions, like in cyanotype process. We can use the technique of gum printing, using gum and colour pigments, and make a Kallitype print, the forerunner of the ‘modern’ darkroom paper. We use contact negatives when printing, which can easily be printed on transparent materials and in any format, thanks to contemporary computers and printers. The prints are not entirely predictable and reproducible, making each print unique. The machines can be used independently after receiving instructions about use. We collaborate with other workshops at the KABK and beyond. We have a good relationship with many of our suppliers, as well as with alumni.